We are excited to host our Annual Latina Leadership Forum & Scholarship Awards event, an event dedicated to the empowerment of Latinas. This year we honor Laura Rodriguez from Yonkers, Lincoln High School and Vanessa Chica, Jasmine Baez, Vanessa Davila all from White Plains High School with Scholarship awards to help them in their pursuit of college degrees. We are very proud of these young ladies and all they have accomplished! We are proud of our long-standing history of building a strong community of women throughout the Westchester County area and surrounding areas. 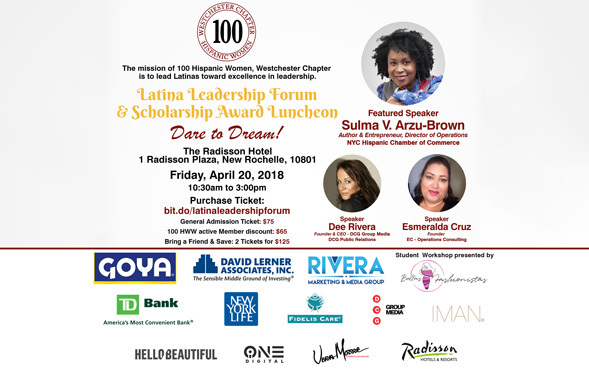 With this event, our goal is to give our members an opportunity to network, visit sponsor and local vendor tables, hear dynamic motivational speakers who empower and enrich the Latino community. Please join us in honoring the amazing accomplishments the four talented young ladies! Students with Valid ID email: info@100hww.org for your discounted rate.